Penicuik RFC remain unbeaten at the top of BT East Two, but they were made to fight all the way at Leith on Saturday. The Midlothian men eventually won 28-23 at Academy Park to record their seventh league win on the spin. Stephen McManus, Alistair McCormick and replacement Vodo Millard (2) were the try scorers for the visitors as they picked up a bonus point. Ross High are second after a 23-14 win over Langholm in Tranent. It was their fifth win in seven outings, but they are 12 points behind Penicuik still. The other three matches in the division were postponed. Meanwhile, Linlithgow and Murayfield Wanderers edged closer to the top two in BT East One with victories on Saturday. The match of the day in the division was set to be unbeaten sides North Berwick and St Boswells playing each other, but it was postponed due to many injured and unavailable front-rows in the East Lothian side’s ranks. As a result Linlithgow and Wanderers took the opportunity to cement their places in third and fourth respectively. 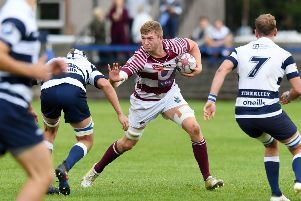 Ross Martin, Chris Bredin and Mark Green all scored tries as Linlithgow defeated Hawick Harlequins 24-17, Martin and Jack Frame kicking the remaining 12 points between them. Murray Hastie was amongst the try scorers and Chris Beattie had a good game as Wanderers defeated Forrester 24-11. Dunbar are fifth after a 20-17 win away at Hawick Linden, while Dalkeith went to Duns and came back with a 22-21 victory.